The character and purpose of this Work are indicated by its title, and by the articles of the present number. The Editor wishes to assemble, upon the high æsthetic ground (away from the regions of strife, in any bad sense), writers of different schools, — that the antagonistic views of Philosophy, of Individual and of Social Culture, which prevail among the various divisions of the Church, and of the Scientific and Literary world, may be brought together, and a white radiance of love and wisdom be evolved from the union of the many-colored rays, that shall cultivate an harmonious intellectual and moral life in our country. Individuals of all parties have already expressed, by letters and in conversation, their interest in this plan; and the Editor hope– another number may present a practical exemplification of the fact, that all believe that on the æsthetic ground all may meet. No one is better qualified for this duty than the author of the suggestion; and the Editor will rejoice to have him 0r others put the plan into execution in future numbers, and hereby gives invitation to them to do it. 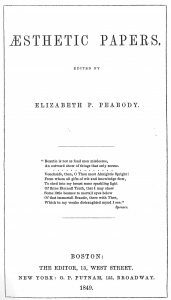 The plan of publication for this Work is like that of the “British and Foreign Review,” which has been the model of its form, size, and type; namely, that a number should appear whenever a sufficient quantity of valuable matter shall have accumulated to fill 256 pages. This will in no case happen more than three times a year; perhaps not oftener than once a year. The terms of patronage proposed are peculiar to itself. No person is asked to subscribe for more than one number in advance; but whoever is so far pleased with the current number as to desire another is requested to send an order to that effect to the Editor, who is also Publisher, No. 13, West-street, Boston. When a sufficient number of orders are given to pay for the publication, including compensation to the authors, a new number will be printed; the Editor being content to receive such profit as may accrue from the sale of other numbers not subscribed for beforehand. The Publisher’s subscribers will have the numbers at $1, payable on delivery. The price at the bookstores will be $1.25. Introduction. — The Word “Æsthetic”. I. Criticism. — S.G. Ward, Esq. II. Music. — J.S Dwight, Esq. III. War. – R. Waldo Emerson, Esq. IV. Organization. — Parke Goodwin, Esq. V. Genius. — Mr. Sampson Reed. VI. The Dorian Measure, with a Modern Application. — The Editor. VII. Correspondence. — J.J.G. Wilkinson. Esq. Member of the Royal College of Surgeons, London. VIII. Main-Street. — N. Hawthorne, Esq. IX. Abuse of Representative Government. — S.H. Perkins, Esq. X. Resistance to Civil Government; a Lecture delivered in 1847. H.D. Thoreau, Esq. XI. Language. — The Editor. XII. Vegetation about Salem, Mass. — An English Resident.